"I used a vintage Millennium Falcon toy / playset for the body. As it's an electric guitar, the body material is relatively unimportant (in comparison to acoustic instruments) so i just had to concern myself with building the necessary structural elements of the instrument into the toy. Since the aging plastic wouldn't be able to withstand the tension of the strings, I pieced together a maple block running from end to end inside the ship. 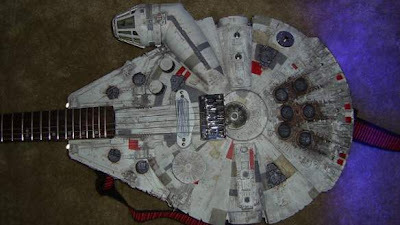 The bridge, neck, and strap pins connect to this piece; while attached firmly with some powerful glues the toy itself is almost entirely cosmetic. The top of the toy has been routed out for the electronics, including some switch activated LEDs. Those required separate battery packs, which I made accessible using the structure of the toy; one pack is hidden in the original battery compartment while the other is attached to the ramp door that was designed to open. Finally, to save time I bought a used guitar neck online, figured out the scale length, built a block coming up from the maple piece (through the top of the ship) to attach the bridge, and made various essential adjustments. 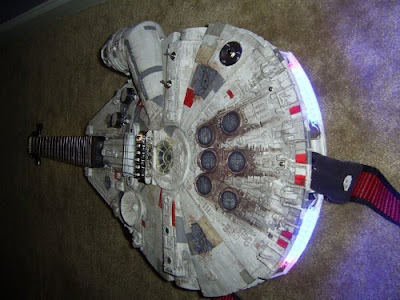 After a paint job based on images of the movie prop and some design ideas I had (the lightspeed peghead with a Micro Machines Millennium Falcon truss rod cover) it was basically finished. There are some things I would change the next time I build one, but overall I'm very pleased with the result." Travis also stated that this guitar was designed to play and that "After this I'm creating a Lord of the Rings bass for a friend."